Researchers from the Helmholtz-Zentrum Dresden-Rossendorf (HZDR) conducted a study on the dynamics of graphene electrons in a magnetic field, which reportedly yielded fascinating results. The HZDR researchers exposed graphene to an extremely strong (four-tesla) magnetic field, and as a result the electrons occupied only certain energy states. These energy levels were examined with free-electron laser light pulses which excites the electrons into a certain Landau level. The surprising result of this test was that the particular energy level in which the electrons were arranged via the laser gradually emptied. 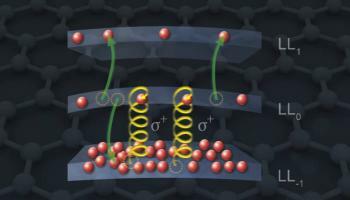 It has been established that energy states of graphene in a magnetic field - known as Landau levels - behave differently than those of semiconductors. Yet, the scientists claim, not many researchers tested the dynamics of electrons in such a magnetic field system. The researchers invested considerable efforts to make sense of this result, and concluded that collisions between electrons cause this unusual rearrangement. This effect, called Auger scattering, was not expected to be this strong, certainly not enough to cause the depletion that was astonishingly witnessed. This new discovery could be instrumental in developing a laser that is able to produce light with adjustable wavelenghts in the infrared and terahertz ranges, which was once considered impossible.